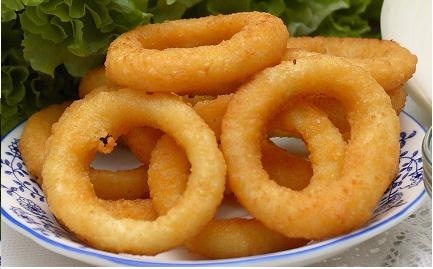 It is very quick fried onion rings recipe. You can have as a side dish with your dinner or You can have it with your evening tea. Serve it with any of your favorite sauce. Serve hot. You can also bake onion rings in oven. First you have to make onion rings batter and then dip onion rings in it and deep fry. Its very simple recipe. Cut the onions in round rings and place them in cold water. Mix flour, egg, milk,salt and ajino motto make a onion rings batter which can coat easily on rings. Drain the water from onion rings. Now dip the rings in the mixture and deep fry them. Serve them with tomato sauce or with any dip you like.